And that’s what happened to ISIC: the craziest, deadliest, most nihilistic Magnus the Last Light Consortium ever produced. Now he’s returned to Solus, and he has one hell of a bone to pick with the cosmos – and the Battleborn who protect it. You might be thinking, “say, all those words are frightening, and those aren’t words I want describing a sentient AI that controls life support systems and airlocks.” Bummer for you: those words summarize ISIC’s resume pretty well. Before his mind fell to pieces, ISIC was the lead manufacturing Magnus at Minion Robotics, where he drove record profits and revolutionized production pipelines. After his mind fell to pieces, he joined a pro-wrestling circuit, tore a dude’s arms off, and decided minutes later that the physical universe is nothing more than a simulation and must be destroyed. So, y’know. Magnus of many interests. 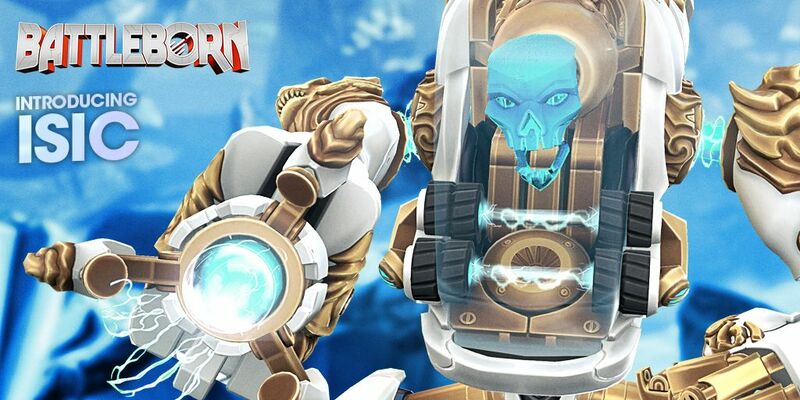 In the Battleborn mission “The Algorithm”, ISIC has seized control of Fort Ocoban – an old UPR mining colony on the ice moon of Bliss – where he plans to strike the killing blow against the cosmos, and free all sentient life from the cruel mockery they call existence. To do this, he’ll need Ocoban’s considerable energy reserves to process the Algorithm: a program that ISIC believes can crash the universe itself. If the Battleborn can stop him, they might just be able to debug ISIC’s considerably buggy code and gain a potent – if a liiiiiittle terrifying – ally in their fight against the Varelsi. Charge Cannon: ISIC’s Charge Cannon fires off rapid blasts for minor damage, or can be charged for a devastating burst of energy at the expense of his movement speed. Energy Aegis: ISIC’s powerful wrist-mounted energy makes him a capable front-line defender. Rotating Wards: A series of five protective wards that spin around ISIC at high-velocity, absorbing damage. Grapple Beam: Fire a beam to lock into a target and watch the fun unfold as a five-ton war machine is yanked across the battlefield at a target. Anything caught in ISIC’s path takes damage as well. The results aren’t pretty. Omega Strike: ISIC turns into a colossal turret. Sure, he’s slow as hell while Omega Strike is active, but who needs mobility when the path to victory is as simple as 1.) aim giant gun, 2.) shoot giant gun, 3.) villain laugh?